Tonight I tackled that decadent Tex-Mex favorite: chimichangas! I don’t eat chimichangas often; they’re delicious but don’t seem a particularly healthy choice. In fact, I can only remember ordering them once in recent years. One of my favorite local mexican restaurants makes them small, and fries them in some sort of basket/rack that pinches them to hold them closed, and serves them up 3 at a time. 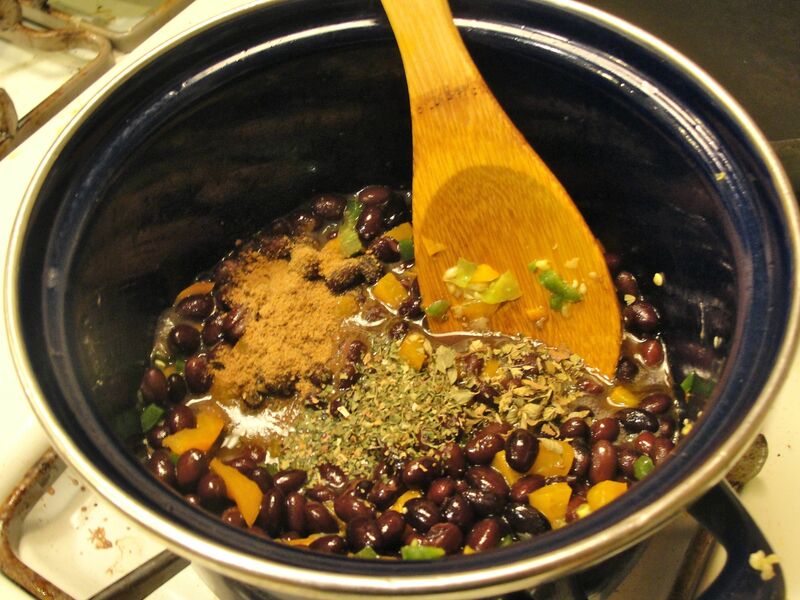 Here, I decided to make large (single-serving), vegetarian chimichanagas instead. To prepare, first sauté the peppers and garlic in canola oil in a small sauce pan. When the liquid has reasonably reduced, stir in the shredded cheese and remove the filling from heat. 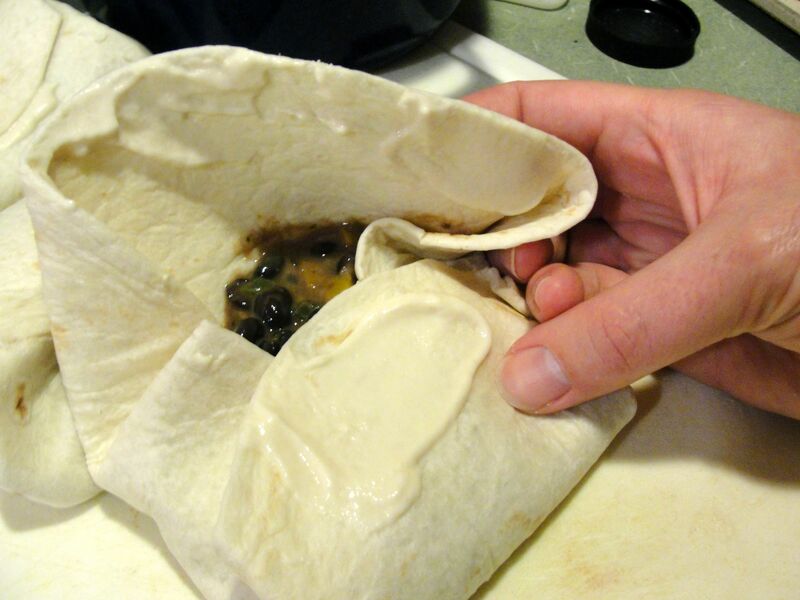 Microwave the tortillas (perhaps 1.5 minutes on high) so that they are supple, and place some of the filling in the center, wrapping each one at a time. 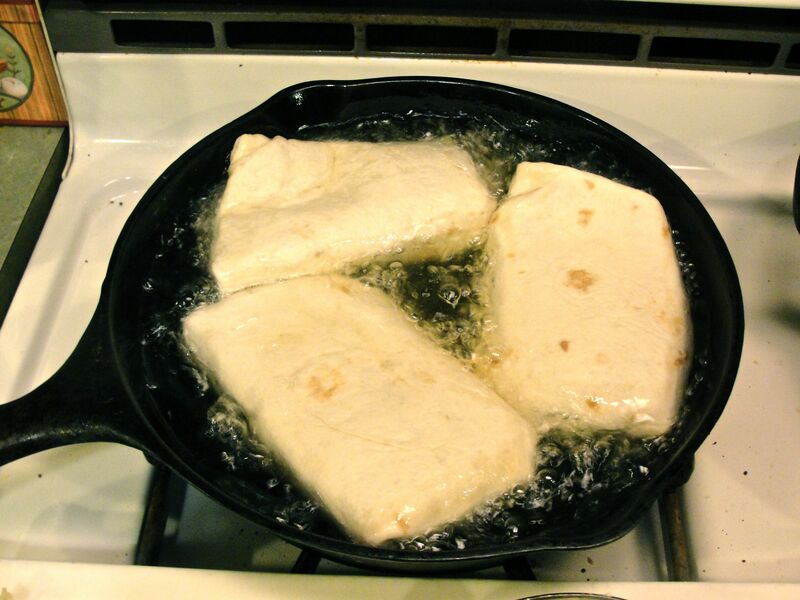 Apply the flour-based glue to the edges of the tortilla when wrapping for deep-frying. Heat canola oil in a pan (to ~300° F), perhaps 1/2 to 2/3″ deep, i.e., just enough so about 1/2 the thickness of the chimichanga is in the oil when they’re all placed in the pan simultaneously. You can test that the oil is at a frying temperature by seeing that it bubbles when a small piece of tortilla is inserted. Place the chimichangas carefully into the oil, seam-side down first. After 2-3 minutes, check to see if the undersides are browned. Turn the chimichangas over, when they’re nicely browned on the bottoms. 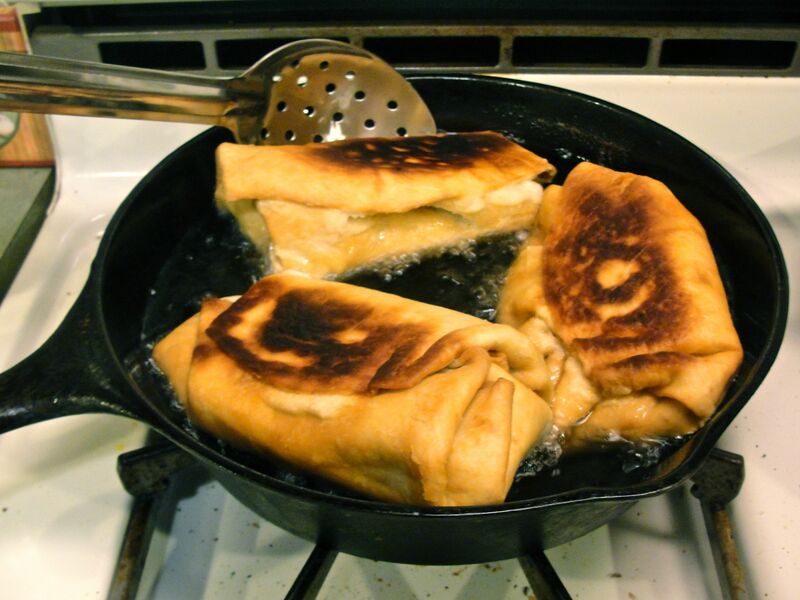 Carefully remove the chimichangas when the tops are attractively browned and place them on a rack with paper towels and allow them to cool slightly while excess oil drains from them. I served my chimichanga with a simple salad of chopped lettuce, tomato, and a lime wedge, and accompanied it with sour cream. 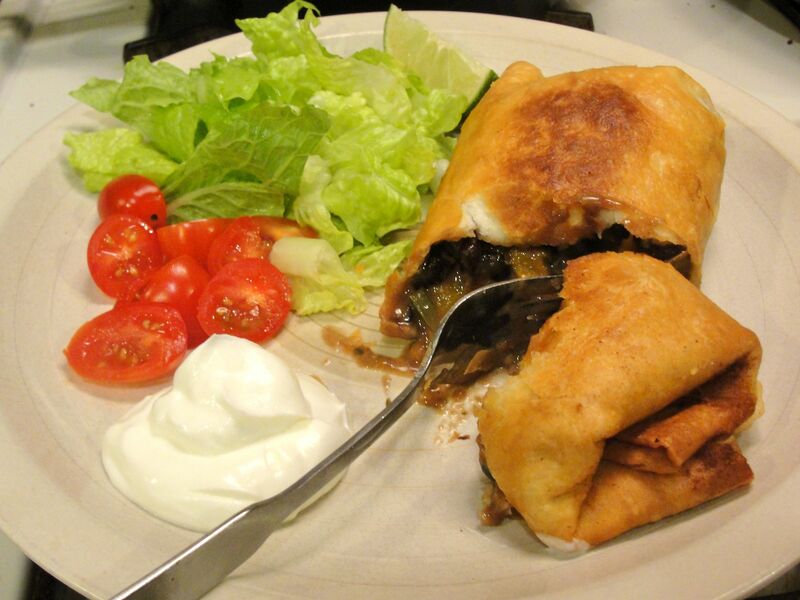 All in all, these chimichangas were as tasty as those typically found in restaurants, and surprisingly easy to prepare; give them a try sometime when you’re in the mood to spoil yourself! To serve leftover chimichangas (from the refrigerator): First, microwave each chimichanga on high, for perhaps 1 minute 30 seconds. 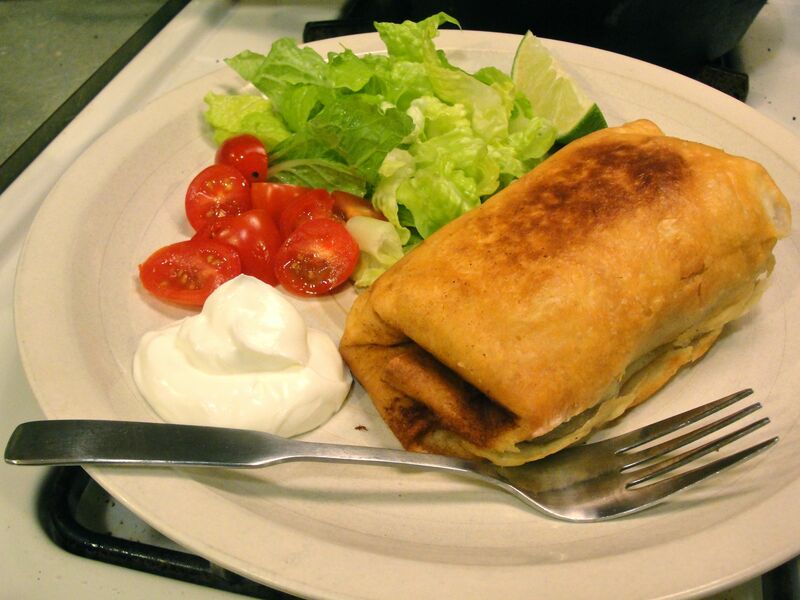 Then bake the chimichanga, optionally covered with sauce and/or cheese, in a toaster oven or conventional oven at 350-400° F for a couple minutes; this will make them wonderfully crispy as when served fresh. At Chi-Chi’s we used toothpicks to “sew” the chimichanga together. They were stitched on the bottom with two toothpicks which we pulled out when plating. That side went down, and then they were covered with sauce (red, white, or “diablo” which was a very spicy pork-based sauce), then shredded cheese. Pop ’em in the 450 degree oven for a few seconds to melt the cheese and serve. The flour/water glue technique works great for frying in a pan. These look delicious!! I’ve been trying to do one meatless meal a week, and I think this will fill that spot very soon! Tonight I made 6 more of them, one for dinner, and the rest for leftovers and friends this week. (Admittedly, this lack of creativity was simply because I had a cast iron pan on the stove already with a fair amount of oil from last night.) This time I didn’t include cheese in the filling, but doubled it in quantity by adding frozen corn and 8-10 oz. of chopped fresh mushroom. I liked the variety in this filling. 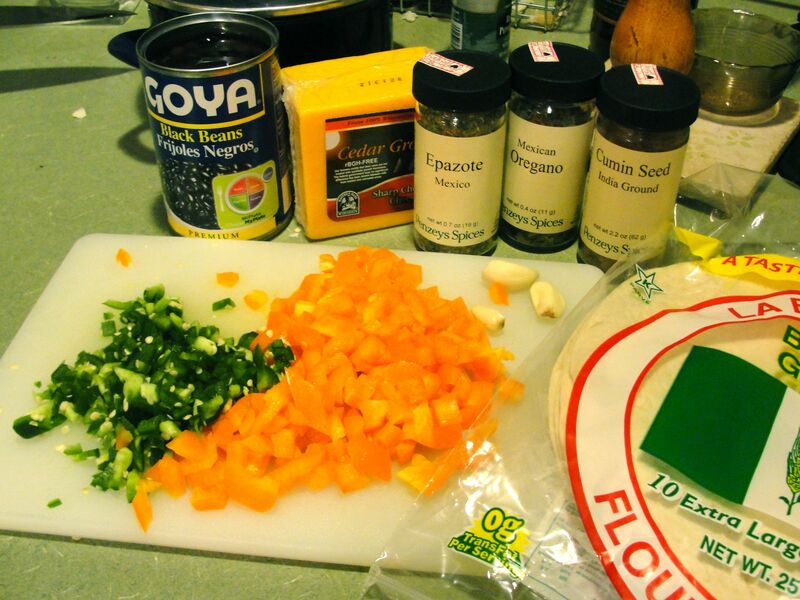 Then I served a chimichanga topped with a puréed sauce of fresh tomato, rehydrated ancho and chipotle peppers, dry roasted garlic, mexican orgegano epazote, and salt… and topped that with cheese melted as suggested in the comment above. Um… YUM!!! I’m putting this on my list for next week, with all the changes you mentioned here. I might even add some boiled sweet potato to the filling. 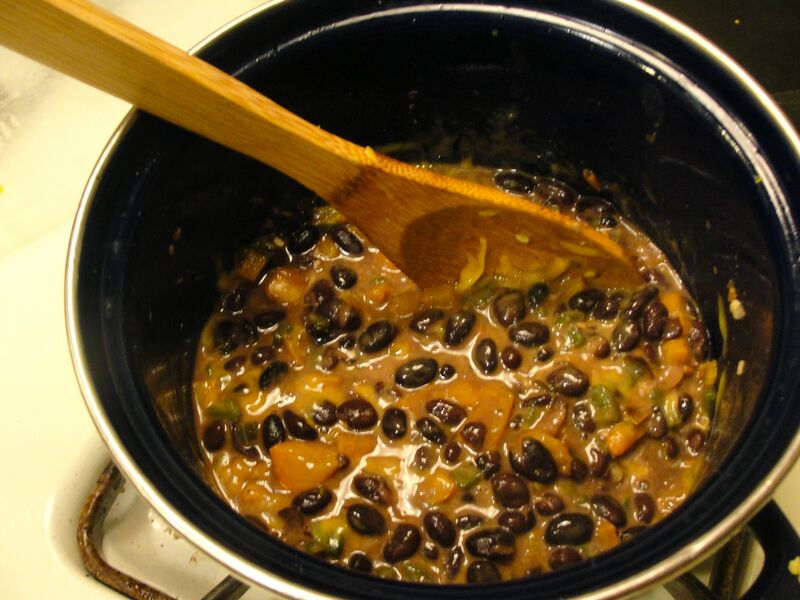 I’ve recently discovered the awesomeness that is the black bean and sweet potato flavor combination. even if the chimichangas are not a very healthy choice they looks very very yummy. Chimichangas are very healthy !! Hell yeah! I love a good chimmichanga!